Having previously entertained you with photos of the great room sole, we thought its support and isolation would be of interest, along with a few other tidbits. 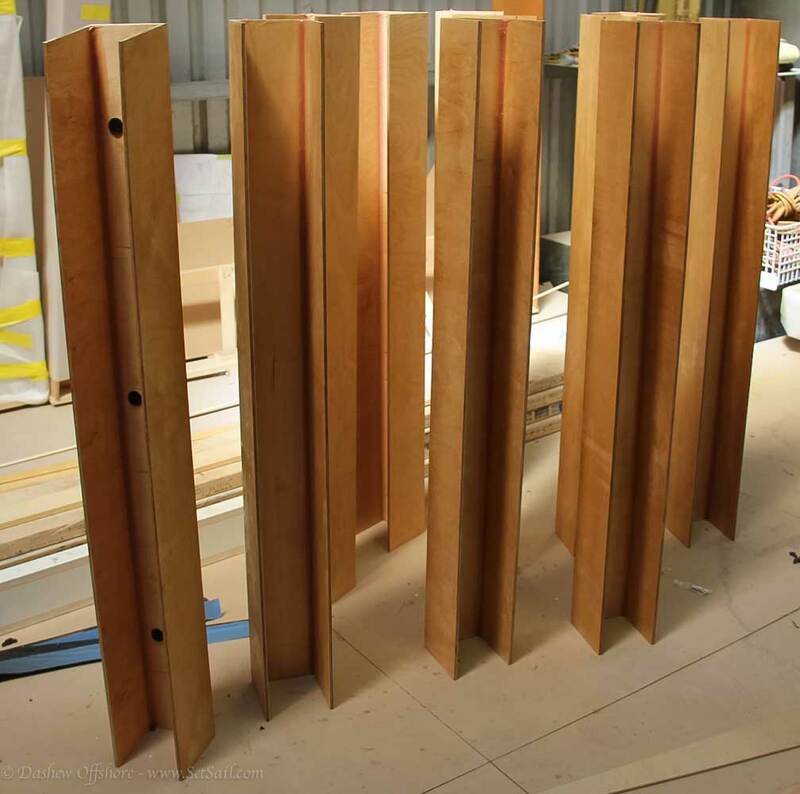 The timber strips to which the sole is attached have noise/vibration isolation material between it and the aluminum structure. 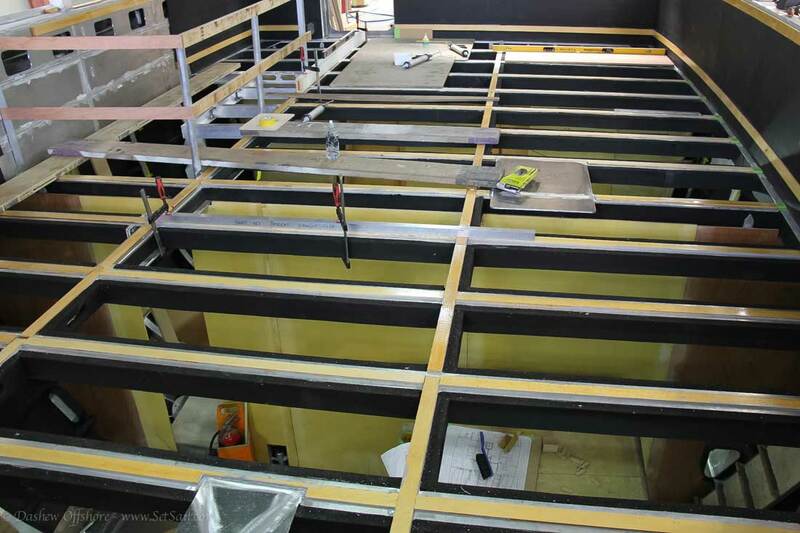 Here we are looking up from the lower deck at the framing, its insulation and a layer of constrained layer dampening material below the great room sole. The engine room bulkhead looking aft from the head compartment. 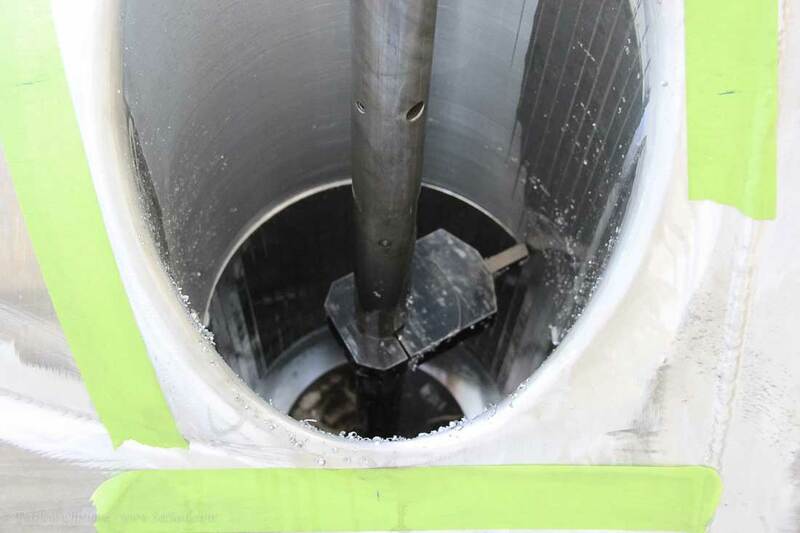 The penetrations and access port will eventually be sealed. 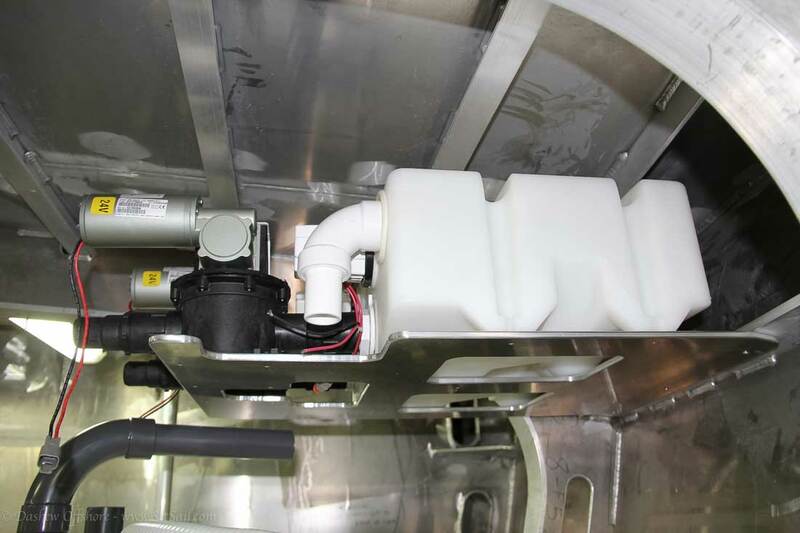 Close up of the access port for inspection and maintenance under the shower module (left side of photo). 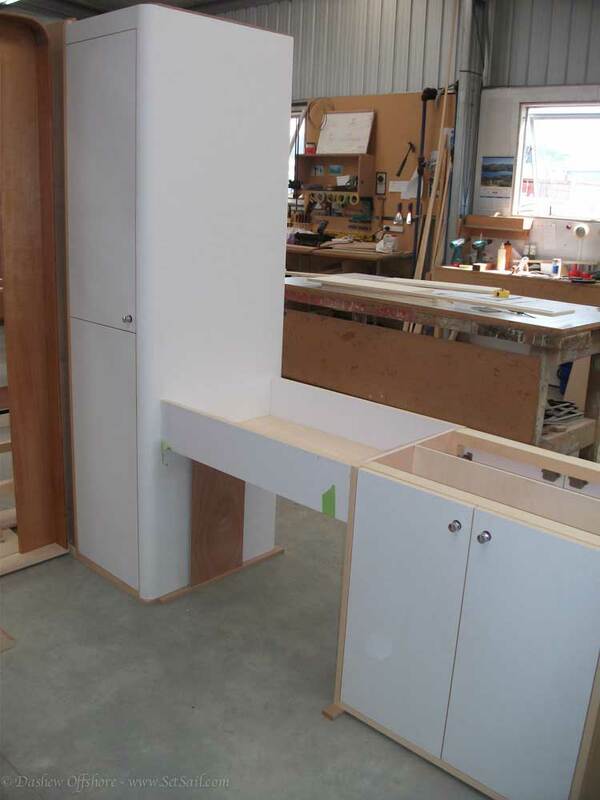 The slotted opening on the side of the photo is for wiring and plumbing. Looking outboard and behind the shower molding. There will be an access hatch through the shower molding back. 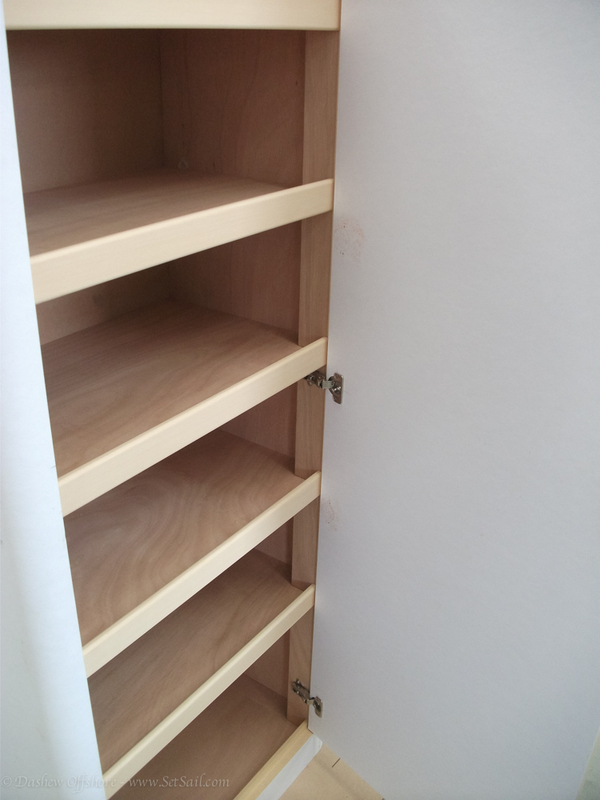 Hanging locker, vanity, and storage locker that goes between guest cabins. Mullion covers. Eventually these will be wrapped with fabric. Switching now to a line boring machine, essentially a portable lathe. 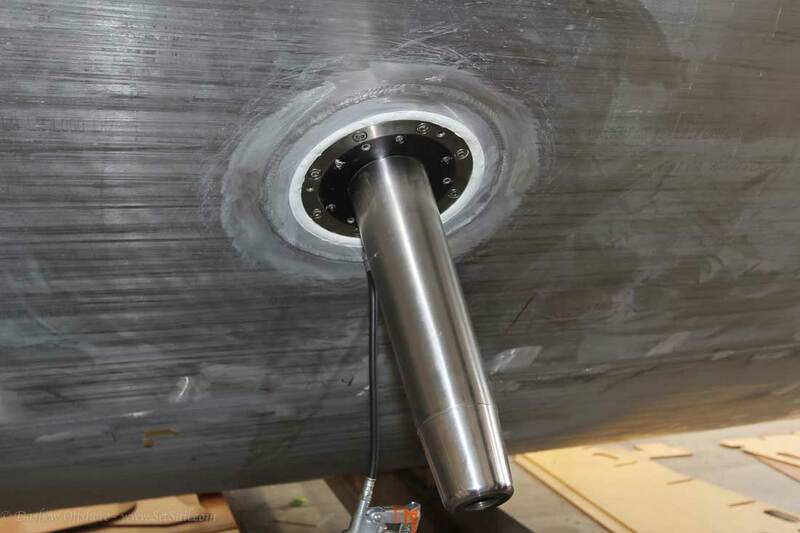 The welded thruster tunnel is being evened up for a close tolerance fit to the thruster prop. A look at the line borer at work from the opposite side. One of the oversized NAIAD stabilizer fin actuators. These are now both installed and ready to have their hydraulic system connected. After exhausting analysis and layout – both on the computer in 3D, as well as inside the engine room in real life, the systems are starting to go in. This is a mock up of the starboard main engine exhaust line. 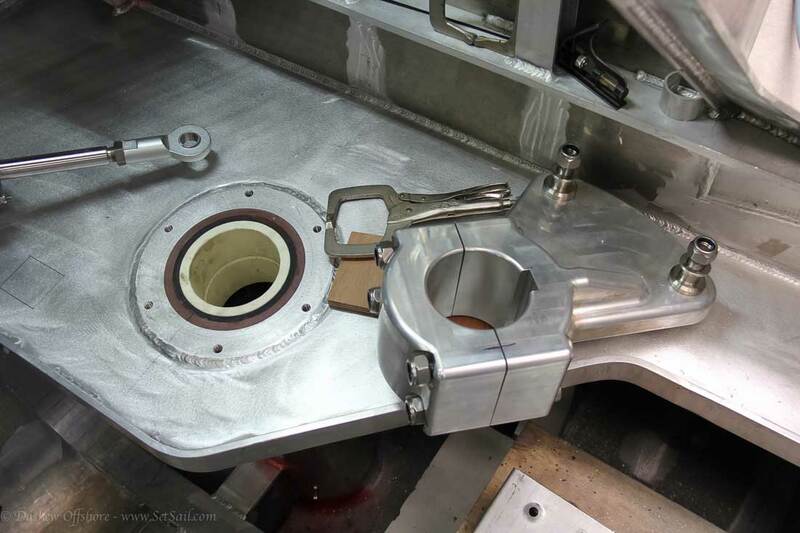 Looking down here at the steering platform, with the rudder shaft upper bearing shown (off white), the tiller which is machined from a solid block of aluminum, and the hydraulic cylinder partially shown to the left. 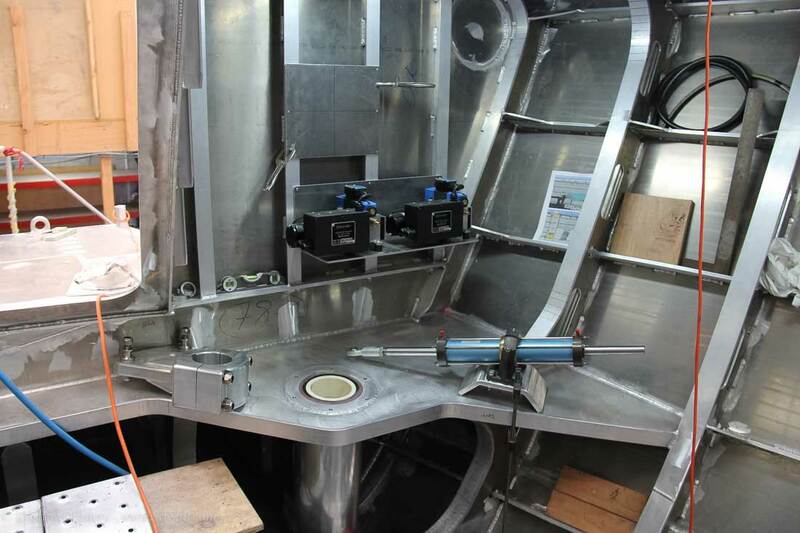 Two hydraulic pumps for the port side system are shown above, with the steering cylinder roughly in place. 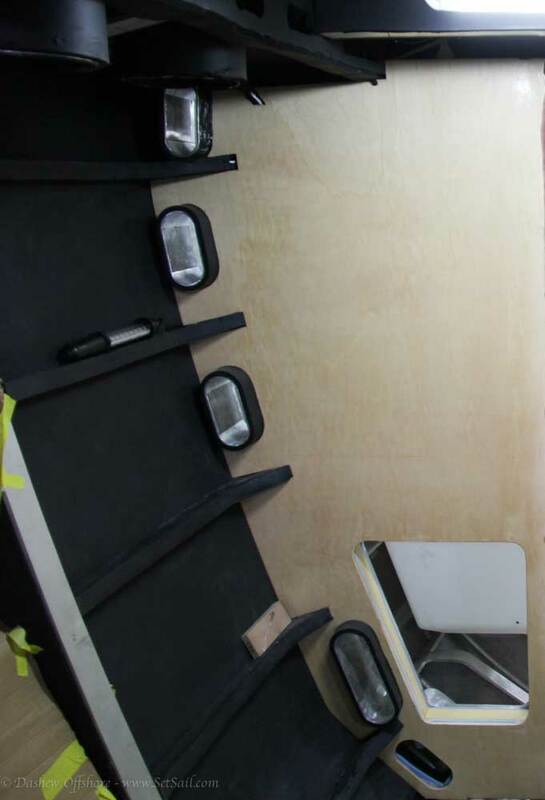 Note how the steering platform is integrated into the hull and swim step platform structure. A small but important system, the vacuum generators for the aft stateroom heads. These are installed so the check valves are serviceable without removal of the pump. The outlet feeds to the blackwater tank which mounts directly below. 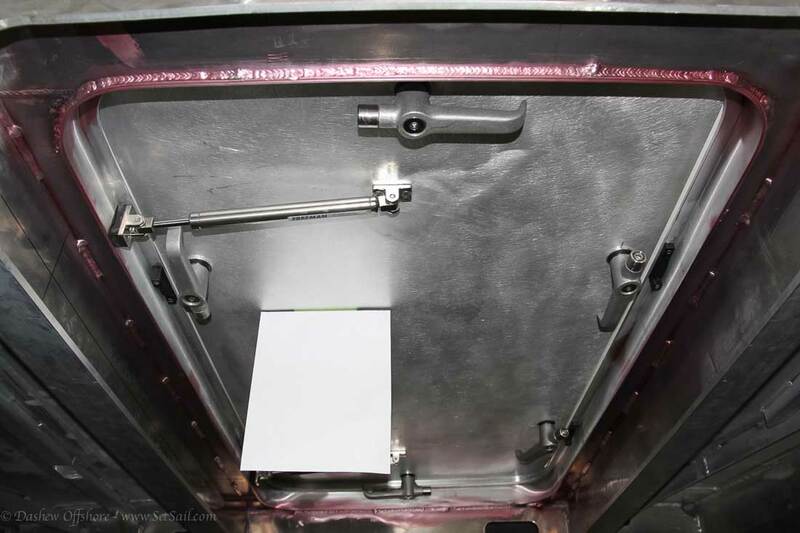 Ever wonder how an internal structural member is welded? 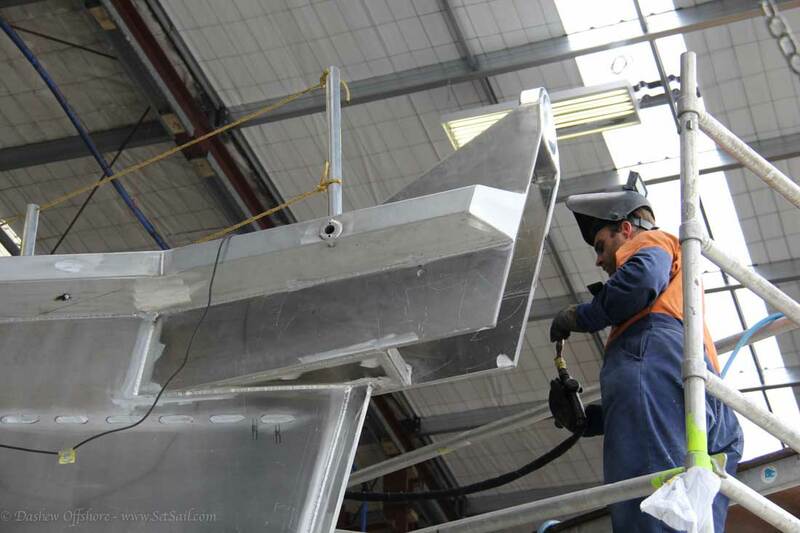 The port side can be welded from the starboard side before the starboard hull plating is attached. But the starboard side is welded through slots cut into that topside plate. Those horizontal grind marks are the weld areas. 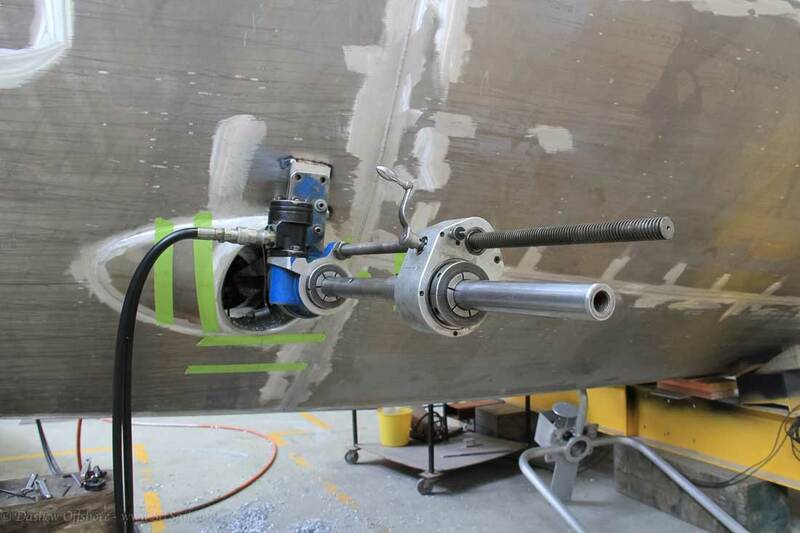 The anchor sprit is designed to provide two additional functions beyond support for the anchor chain. 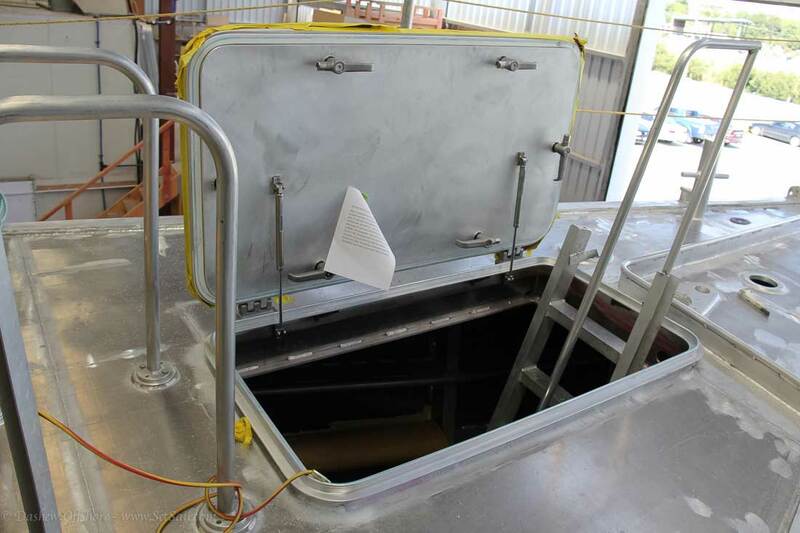 First, it will act as a walkway (albeit tight) so that we have a relatively easy method of rigging bow springs and anchor snubbers through the fairlead. Second, this is in effect a dive plane, with a positive angle of attack relative to the shape of the shear (hull to deck intersection) and in the unlikely event of driving the bow into an exceptionally steep wave, may provide a bit of lift. This is the hatch into the forepeak. And a view of the interior side of the forepeak hatch. We will close with this shot of the next bay over where FPB 78-2 is getting her great room roof dropped into place. FPB 64-11 is next in line, and then to the right is FPB 78-3. This entry was posted on Friday, April 3rd, 2015 at 3:00 pm and is filed under Dashew Logs, FPB 78, The Logs, three. Both comments and pings are currently closed. Hi Steve: Previously, the main engine exhaust was shown as close to deck level. Did the exhaust change to below the waterline for noise abatement? Also, with regard to the great room, does changing the orientation of the stairs change the layout of the starboard aft section of the great room (to, say, a nice office area :))? Stair orientation remains going forward as you drop down. 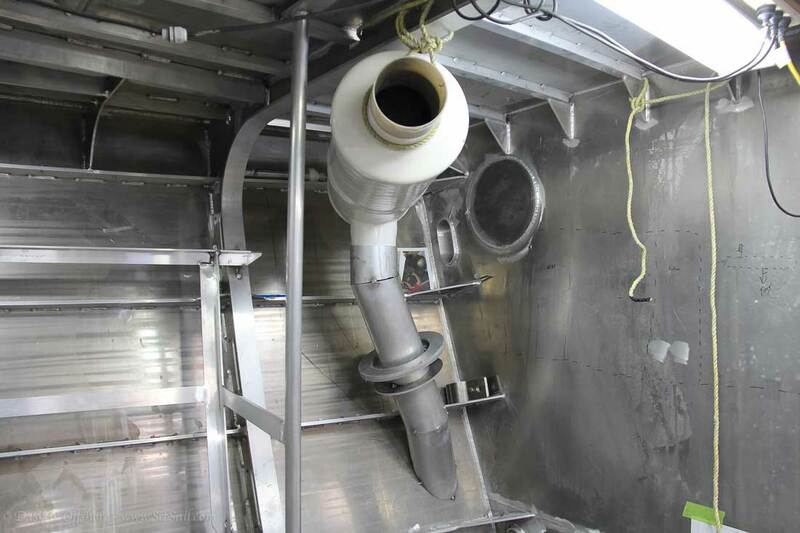 Engine exhaust remains about 80cm/32″ above the waterline. Curious about why two pumps per cylinder, and which pumps they are. They look like Accusteer, but I can’t tell with the photo resolution. I have the same dual steering cylinders, but only one pump. Yes,Accusteer. Dual pumps for speed control and extra reiability. Hi there Steve, I hope you and yours had a wonderful holiday. The question regards insulation. Looking at the photo of the shower enclosure access I must ask if the areas of limited access are not insulated, or do you use something else to insulate these spaces? Also, do you insulate the engine room as you would the any other occupied spaces? 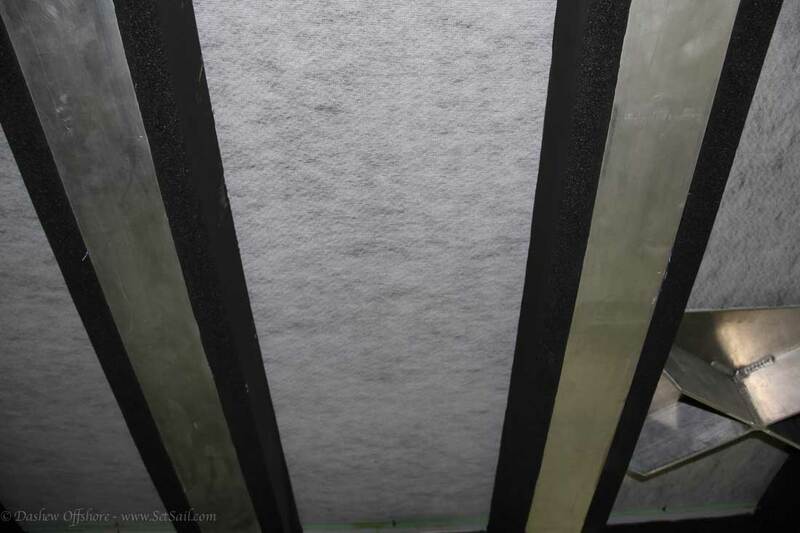 We will do a post on the engine room in a month or two detailing its insulation. 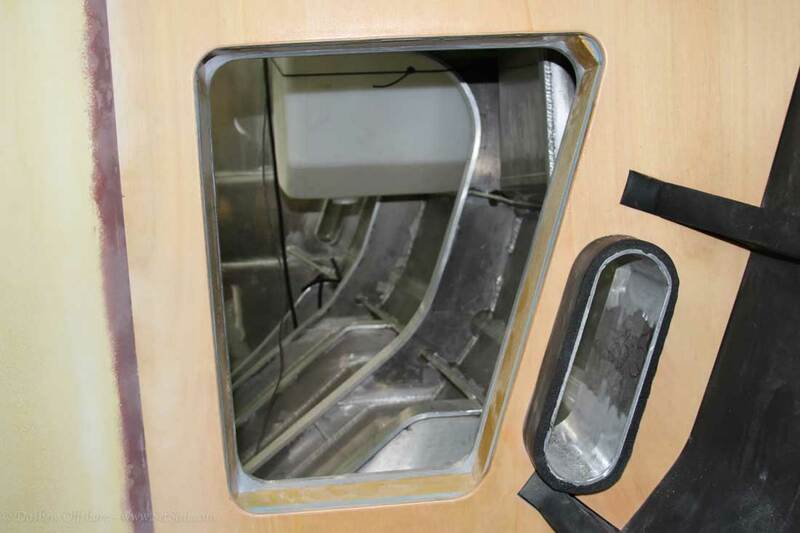 As to the area outboard of the shower molding, it has the sysem previously discribed plus additonal noise protection.Under the soleof the shower is an additional layer of foam plus the molding itself is foam cored. Hulls 2 and 3 in the welding shed. Where’s 78-1? NCAA games are done Steve, we need updates. Ok everybody lets go, updates, updates, updates…. 78-1 i in the next shed over being fitted out.We arepretty much done with the 78 so there will be more time for updates. 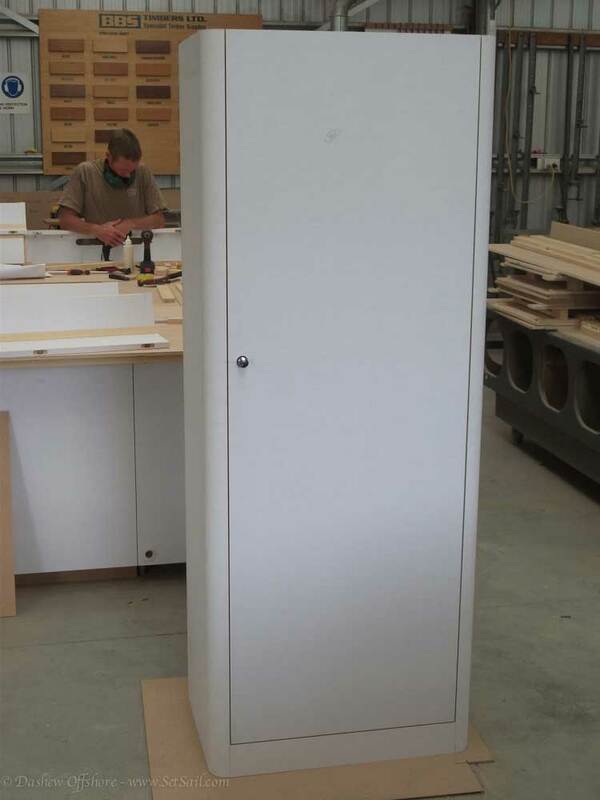 What are the dimensions of the forepeak hatch? 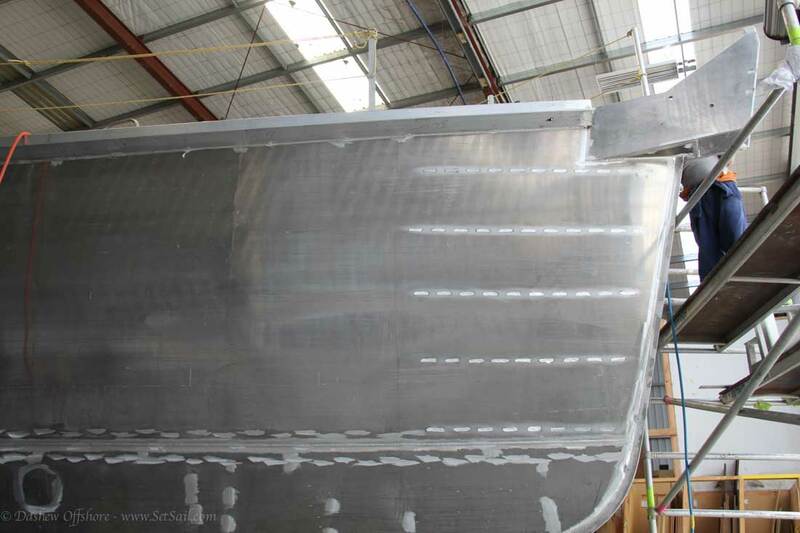 The foredeck hatch on the FPB 78 is 1.4m long and 80cm wide. All of the FPB Dorade vents, including the headliner vents in the great room can be adjusted for air flow or sealed from the inside.